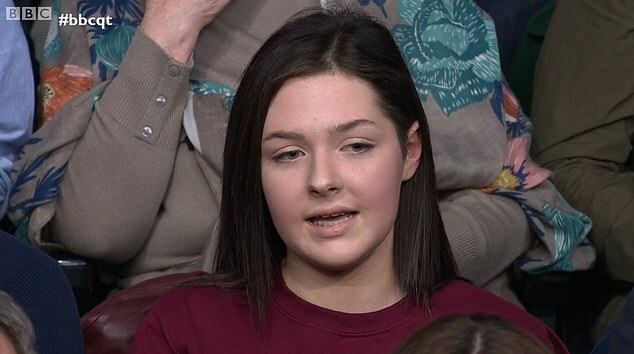 A teenager who wowed Question Time viewers with her ‘wonderfully eloquent’ assessment of Brexit is using her new platform to push for votes at 16. 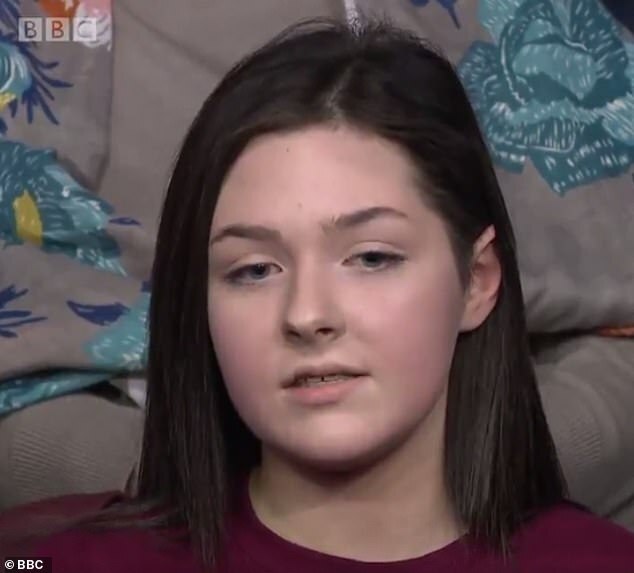 The 16-year-old, a member of Labour’s youth wing, delivered a damning assessment of ‘party putting itself first before the country’ when she appeared on the BBC programme in Belfast last night. 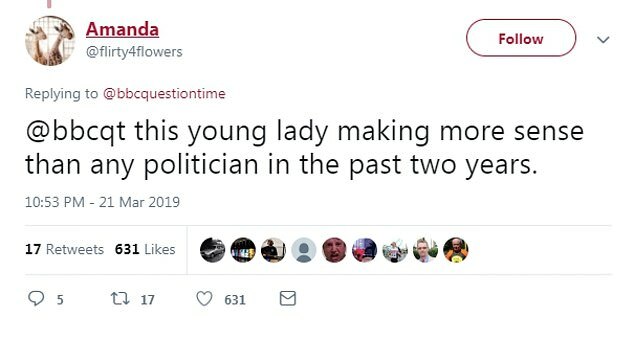 She proposed an extension and a return to representative democracy through a general election, ‘because that’s what this country was built on’. 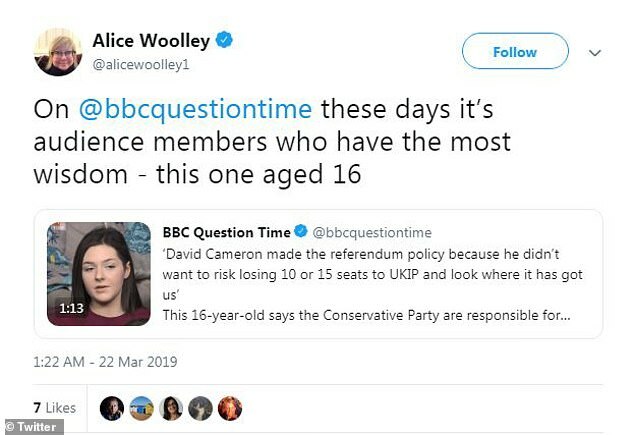 The teenager said: ‘David Cameron made the referendum policy because he didn’t want to risk losing 10 or 15 seats to Ukip. ‘And look where it has got us. 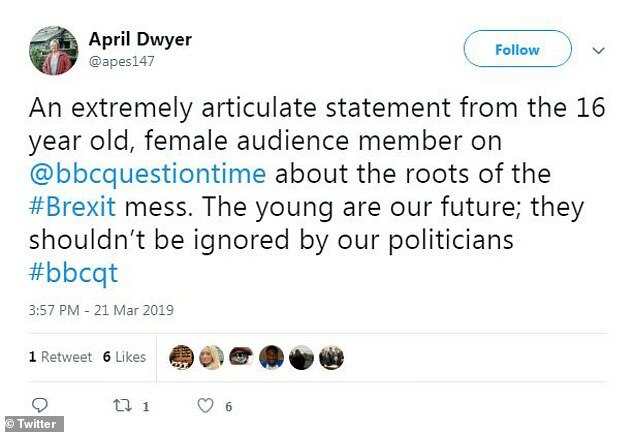 ‘This has always been because of the Tory Party playing party politics with issues that are going to be huge generational changes for all of us. ‘I am 16 years old. I didn’t get a say in Brexit and I won’t get a say in it, because there is not going to be a second referendum as things stand. ‘Either way I think what we have to face is this is not an issue of parties not coming together, this is not an issue of direct democracy – a People’s Vote being able to solve where it failed in the first place. 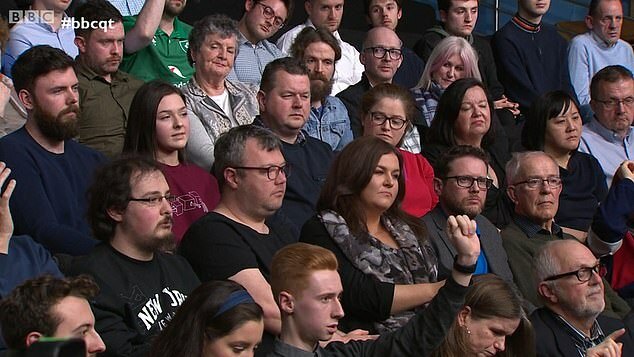 On the panel for Question Time last night were Conservative minister Tobias Ellwood, Welsh Labour Party MP Nick Thomas-Symonds, DUP MP Jeffrey Donaldson, Sinn Féin politician John O’Dowd and Polly Mackenzie, Chief Executive of Demos. 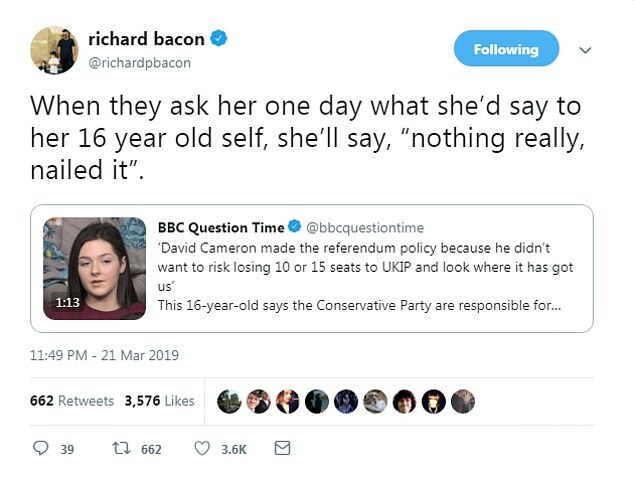 The teenager drew praise on social media for her calm approach and eloquence, with some users calling for her to be made Prime Minister. 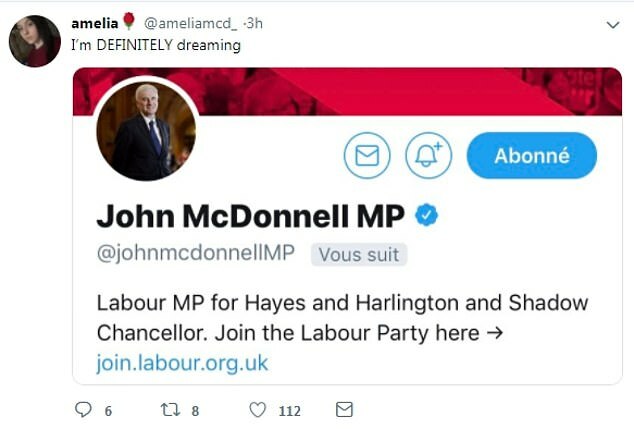 She also tweeted that she was ‘DEFINITELY dreaming’, revealing that Shadow Chancellor John McDonnell was following her after a clip of her statement drew 1.6million views on Twitter. 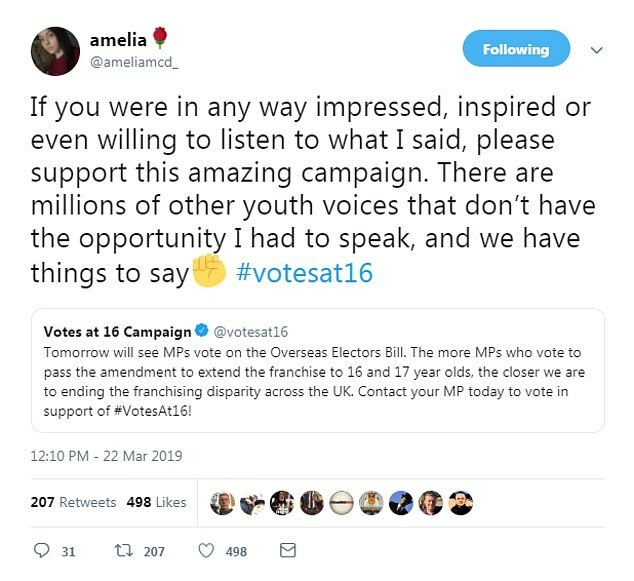 One social media user tweeted at Amelia, telling her that she felt secure knowing her 11-year-old son would be in good hands with her representation. 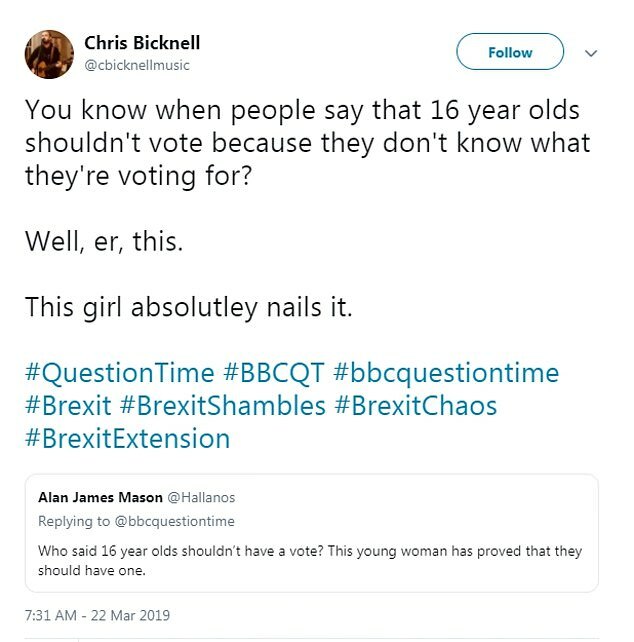 Others called for the teenager to be made PM – with one person saying ‘at least give her the vote’. Her comments were not universally praised, however.